Can a Disabled Muslim Comic-Book Superhero Save the World? As Spider-Man said, with great power comes great responsibility. For most superheroes, that means saving cities from rampaging monsters and thwarting the plans of evil masterminds. But achieving world peace? There's no superpower for that. Yet that's the mission that lies before the Silver Scorpion, a brand-new comic-book hero who, his creators hope, can one day end the tensions between the West and the Muslim world. A collaboration between Los Angelesbased comic-book company Liquid Comics and the Open Hands Initiative  a nonprofit stemming from President Obama's pledge to extend America's "open hand of friendship" to the rest of the world  the Silver Scorpion is the brainchild of a group of young disability advocates from the U.S. and Syria. Brought together at the first international Youth Ability Summit in Damascus in August 2010, the attendees, who are all disabled, were asked to create a superhero who reflects what they have always wanted to see in a comic book. The kids had never met before. They spoke different languages and came from different cultures and backgrounds, but they immediately clicked. "At first I thought, What do I wear? How do I say hi? But within five minutes of meeting we became friends," says Shafeka Hashash, a teenager and disability advocate from New Jersey who helped construct the comic's storyline. The idea was to come up with a character that readers from East to West could relate to. And so the Silver Scorpion was born. He's the alter ego of teenager Bashir Bari, who comes from a fictional Arab city and loses his legs in an accident triggered by gangsters. Confined to a wheelchair and consumed with anger and grief, Bashir retreats into isolation  until he witnesses the murder of a mysterious metalsmith and is unknowingly chosen as the new guardian of an ancient power that allows him to manipulate metal with his mind. As the series continues, readers will be introduced to various other superheroes  some disabled, some not  who must join forces to combat an evil force that threatens the peace and stability of their world. To do that, they learn to overcome adversity in the face of physical, social and gender limitations. The message is simple: just because we're different doesn't mean we can't work together toward a common good. "The kids who created the superhero are now serving as unlikely diplomats at a revolutionary time," says Jay T. Snyder, a philanthropist and founder of the Open Hands Initiative. In a surprise twist, none of the young people who helped create the Silver Scorpion suggested that he should use his power to cure his disability. "The Silver Scorpion is essentially empowered by who he is and doesn't look at his superpower as a way of wishing he was something else," says Snyder. 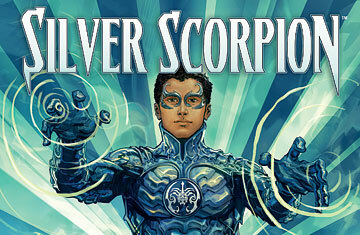 Launched in Arabic earlier this month, the Silver Scorpion comic book will debut in English in the U.S. this month. With each of the characters representing a common bond between Americans and Arabs  everything from the experience of coping with inequality to the love of a good pop song  the series aims to show comic-book fans in the Muslim world and the U.S. that their counterparts are really a lot alike. "With these characters we created a dialogue between two cultures that transcends race, religion and politics," says Marc Smrikarov, who helped organize the team of advocates for the Open Hands Initiative summit. All the best superheroes reflect the fears and themes of the societies that created them. Spider-Man (bitten by a radioactive spider) and the Incredible Hulk (accidentally bombarded by gamma rays) first appeared during the Cold War, a time when everyone was worried about radiation. Some believe the X-Men, a community of mutants persecuted by humans, were allegorical of the civil rights movement. For today's youth, it's all about interconnectivity and the ability to communicate with someone  or many someones  on the other side of the world with the stroke of a key. "We've created a global hero emblematic of global change and a global community," says Snyder. But so far, the most popular superhuman crime fighters have been angst-ridden, all-American good guys fighting fantastical enemies. Is the world ready for a disabled superhero fighting the real-world evils of racism and religious hate? "It's 2011. Little baby steps won't do," says Hashash. "We want our superheroes to save the world." See "Islamic Superheroes Going Global." See the top 10 tiny characters.